Gwynfor and Layla run our very busy kitchen. They create a huge range of delicious foods using our own meat, fruit and vegetables. 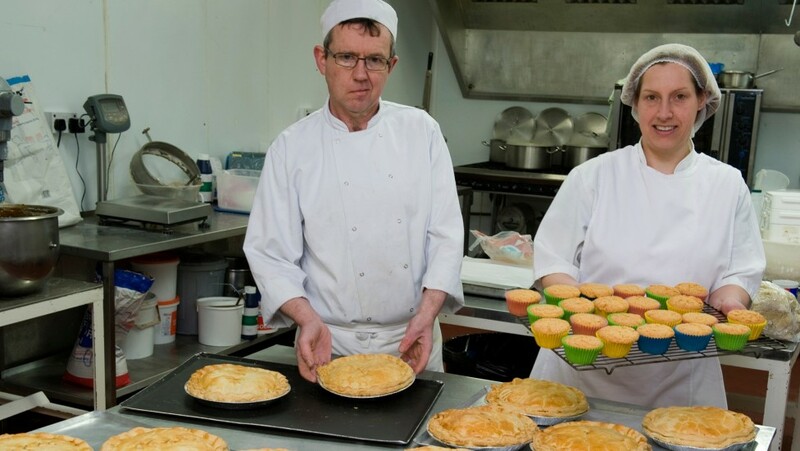 Gwynfor prides himself on his richly flavoured pies and casseroles; his Welsh Black Steak Pies are legendary! He is also responsible for our curries, cottage pies, lasagnes, and many more mouth-watering ready prepared meals. Layla is responsible for our addictive range of cakes. Her Victoria sponge cakes are light and her lemon cakes are moist and zingy. Let her know in advance and she will even bake you a celebration cake. Traditional recipes are used to make Welsh classics such as Bara Brith, Welsh Cakes and Abberfraw biscuits. Layla makes our jam, turning our fruit into a wonderful range of preserves. Among others, our strawberry and raspberry jams are our most popular. Our own vegetables are used to make chutneys and jellies. Choose from Beetroot Chutney, Rhubarb Relish, Onion Marmalade with Garlic, Mint Jelly, and many more. Christmas is a busy time in the kitchen. Christmas cakes are baked and decorated, Christmas puddings are steamed, and mince pies are made along with many other festive treats.